Be the first to share your favorite memory, photo or story of Brett. This memorial page is dedicated for family, friends and future generations to celebrate the life of their loved one. Brett Kenneth Martin of Olney Springs, Colorado entered into rest, March 25, 2019 in Pueblo, Colorado. 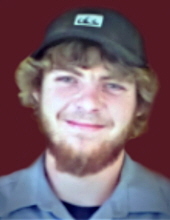 He was born August 22, 1997 in Pueblo, Colorado to Michelle Martin and Darrell McDonald, Jr. he was 21 years of age. He is survived by his parents, Michelle Martin and Darrell McDonald, Jr., brothers, Matthew Stiefel, Kaelub Suiters, grandparents, Darrell (Debbie) McDonald, Sr., Mark (Marie) Taylor, Sherman (Bernadine) Martin numerous aunts, uncles and cousins, many friends and his baby dog, Daizy. Brett is preceded in death by his grandmother. Brenda Marie McDonald, great-grandfather, Robert L. Martin, great grandparents, Doris Lake, Virgie and Delbert Clark. He enjoyed tinkering with electronics and stereos. He loved working on cars. He also enjoyed motorcycles and dirt bikes. He also enjoyed camping, hunting, fishing, concerts and loud music. He especially loved spending time with friends and his family. An 11:00 A.M. celebration of Brett’s life will be held Friday April 5, 2019 at the Pitkin Avenue Baptist Church in Fowler, Colorado. Pastor Bobby Johnston will be officiating. To send flowers or a remembrance gift to the family of Brett Kenneth Martin, please visit our Tribute Store. "Email Address" would like to share the life celebration of Brett Kenneth Martin. Click on the "link" to go to share a favorite memory or leave a condolence message for the family.